This selection of 24 beautiful Red Roses will certainly impress your lucky Valentine! To make this Valentine's bouquet even more impressive, we have added luxurious copper ruscus and a selection of greenery. 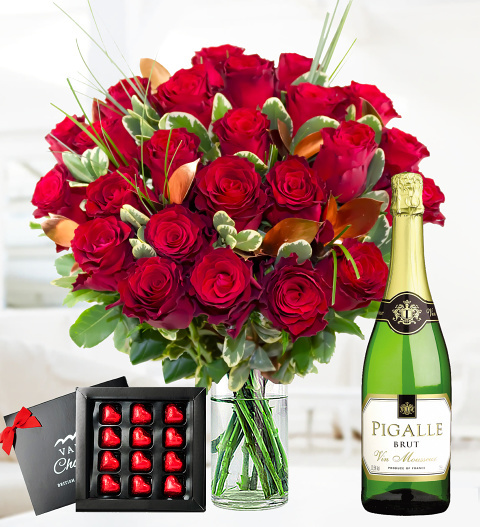 To compliment the Valentine's Flowers, we have added a box of chocolates and a bottle of sparkling white wine to make it the perfect Valentine's gift for Valentine's Day. This sturdy long lasting Rhodos red rose comes with an average head size of 5cm.